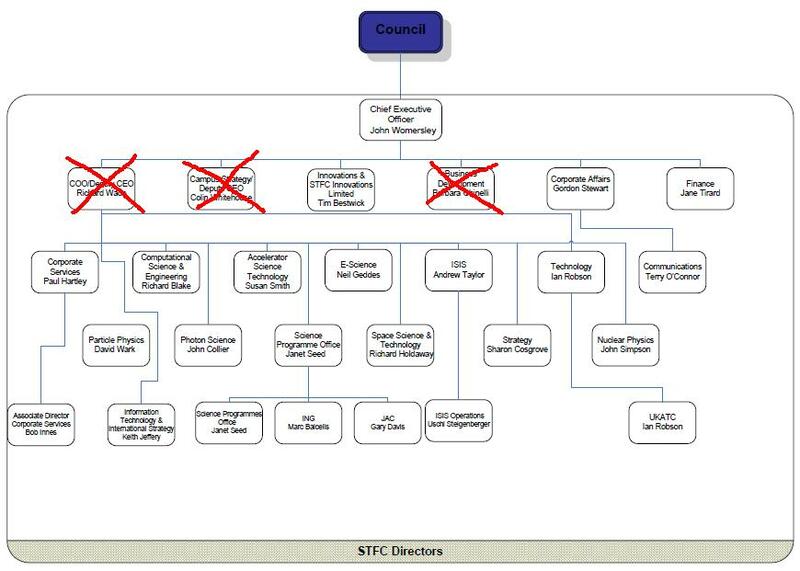 It’s been such a busy day today I almost missed a seemingly unimportant message on Twitter from the Science and Technology Facilities Council about its new management structure. Only when I got home this evening did I read it carefully and discover that it’s not really as innocuous as I’d assumed. In fact it looks like the Chief Executive has been busy during the recent transfer window. It doesn’t look all that different from the old one, except it’s a slightly more compact formation with less width in the wide areas, and perhaps fewer clichés in the final third. In addition, Mrs Jane Tirard will continue in her role with the new title of Executive Director Finance, and Dr Janet Seed will extend her acting stewardship of the programmes area as Acting Executive Director Programmes pending an open recruitment exercise for the position. For example, out goes hard-tackling wide man and own-goal specialist, Richard Wade, who apparently leaves on a free transfer. Or is he just on the subs’ bench for the time being? According to the diagram, Tim Bestwick stays but will move from a central position to the right side, roughly changing position with Gordon Stewart who also keeps his place in the team. Andrew Taylor, formerly in midfield, moves to an inside forward role where, as Director of the National Laboratories, he will sometimes be “in the hole” (i.e. Didcot). Most pundits reckon the new-look STFC will deploy a Diamond-Light Source shaped midfield aimed at closing down the opposition, as opposed to the old team which concentrated more on closing down its own facilities. It looks like the reorganization was made with one eye on European challenges, but Womersley remains committed to the national game, as last week’s scouting trip to the University of Neasden makes clear. The STFC supporters’ club (Sid and Doris Bonkers) expressed delight with the team changes, but former manager Keith Mason remains bound and gagged in the basement of UKSA was unavailable for comment. 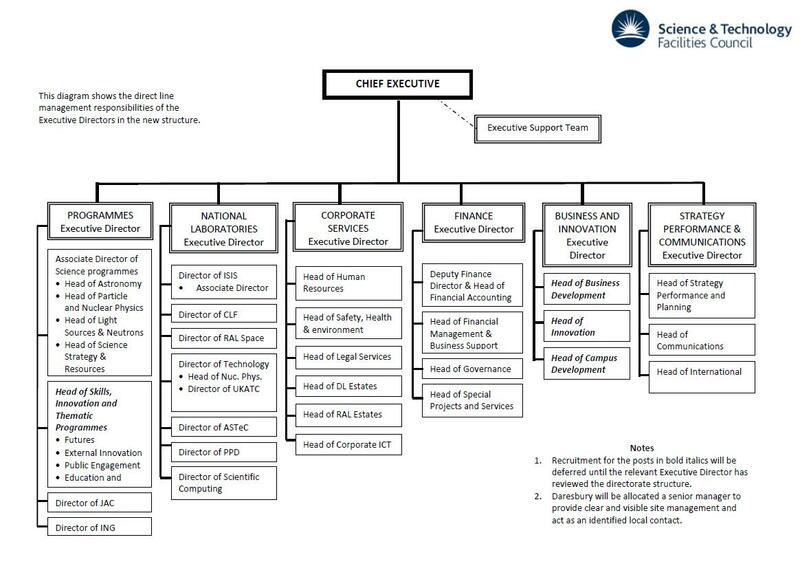 STFC has benefited from the very significant personal contributions of the existing senior management team. They have helped develop STFC into a successful workplace as recognised by the recent Investor in People accreditation (Silver status), and our positive Comprehensive Spending Round outcome. However, the changing dynamics of STFC mean that it is time for a change and not all senior managers will continue with the organisation. Do I detect a note of insincerity? This entry was posted on February 27, 2012 at 9:57 pm and is filed under Football, Science Politics with tags John Womersley, STFC. You can follow any responses to this entry through the RSS 2.0 feed. You can leave a response, or trackback from your own site. I doubt that anyone in the particle physics community will mourn the departure of Richard Wade. I certainly won’t.